Yesterday, was such a boring day. The weather started out nice and then the fog rolled in and stayed most of the day. When it gets like that, I tend to get lazy. I had all of my ambition in the morning, going to make a nice breakfast, workout, make some bread, do some chores and maybe go to Trader Joe’s for some goodies. Well my laziness kicked in and I didn’t feel like working out, I pushed myself to make bread and I did manage to do laundry but everything else was ehhh, I’ll do it another day. Do you ever have days like that? However, I always make sure I have a good breakfast, no matter what! I made a wonderful new oatmeal with Coaches Oats. 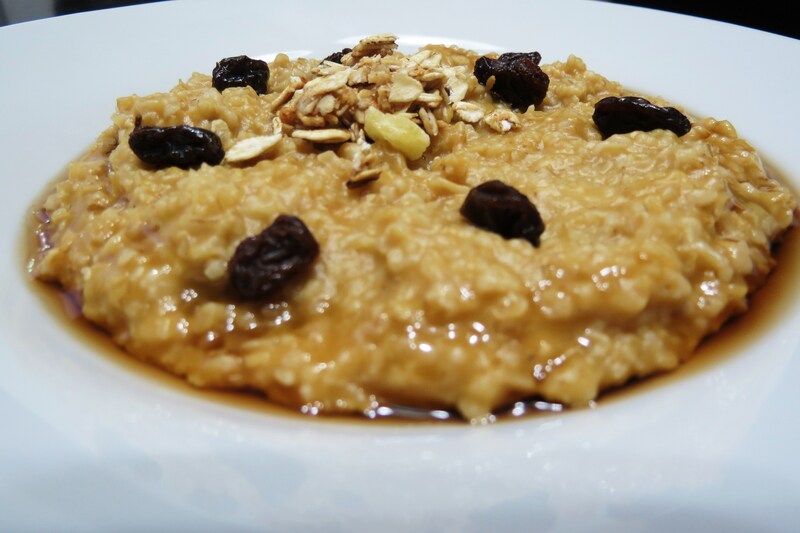 Have you ever tried Coaches Oats? It’s so good, I like the texture of it and it fills me for hours. I can’t complain about that, no snacking for me. What makes this recipe different? I added Sweet Potatoes to it. Wow, did it really wake up my oatmeal. I’m normally a traditional oatmeal type of person, some fruit, brown sugar and maybe some milk. But not today, I wanted something different. During my day, my dog was barking in the kitchen, so I looked out my kitchen window and saw this little face looking at me. Then I turned around and saw this. That cat knew! There not stupid! 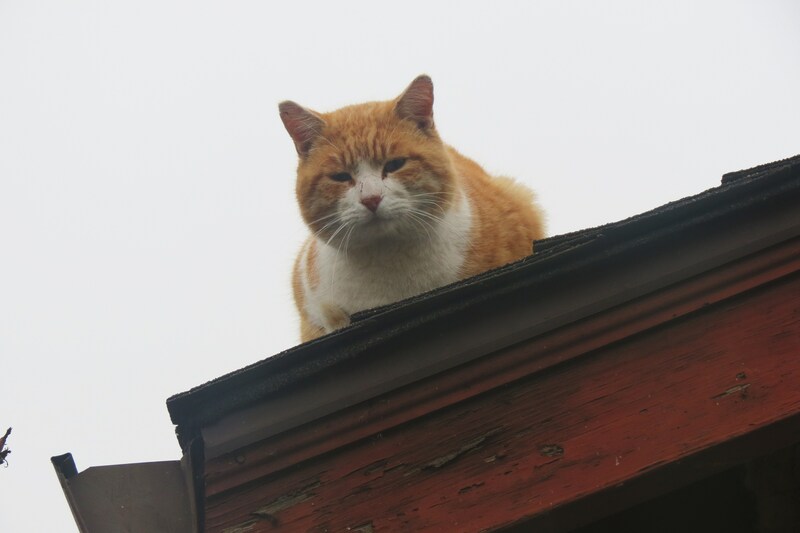 I think the neighborhood cats purposely love to antagonize my dog. Needless to say, the cat stayed there for hours, but my dog finally gave up! 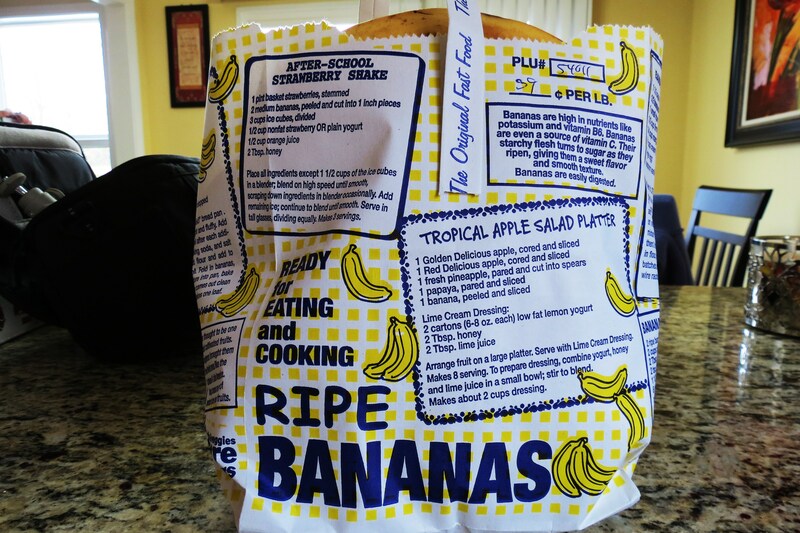 Also, I did run to the store real quick to pick up some parchment paper and I found already ripe banana’s. I was so excited, I bought a big bag for $2.00. That means lots of smoothies and banana bread. I’m totally excited over that one. I feel like I won a mini lottery. I have no life, but I will have bread! Speaking of bread, I made a new recipe for whole wheat dinner rolls. There so good and healthy, but I’ll share that recipe with you probably tomorrow. But for now here is my recipe for my sweet, sweet, sweet Sweet Potato Oatmeal. You must try it. Oh, and I bet if you don’t have sweet potato puree, pumpkin would be great too! I used the brand “Farmers Market” Organic Sweet Potato. Nothing added, just the sweet potato. Perfect sweetness! In a pot, add water. Bring to a boil and add oatmeal. Cook for 5 minutes or until it gets thick and water is absorbed. Stir in Sweet Potato Puree and cook until warm, about 1 minute. 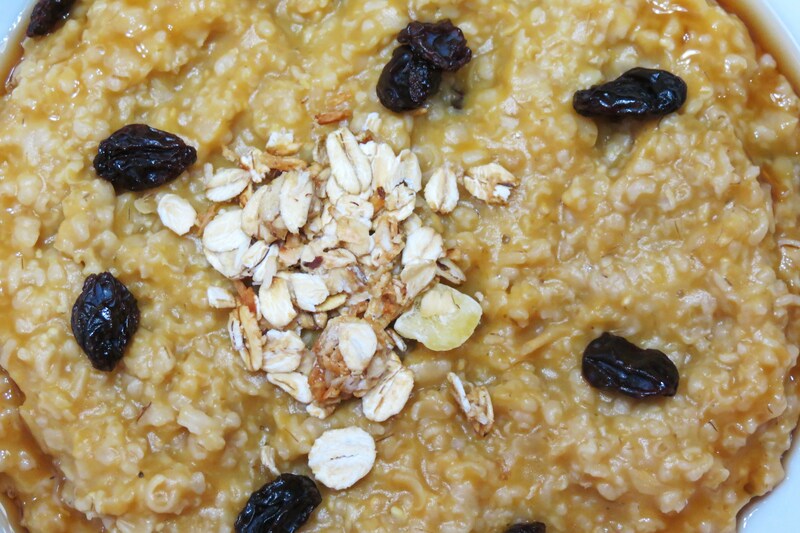 Let your Oatmeal sit for a minute to really thicken up. Add your raisins, granola and maple syrup. Sit back and enjoy!! Well, my Husband is waiting for me. He put in Horrible Boss’s. Have you ever seen that movie? I saw it at the theater when it came out. It is so funny, I can’t believe Jennifer Aniston plays that dirty part, I love it! Have a great day!! I totally have lazy days…especially now that it’s cold. Getting out the door takes SO MUCH EFFORT. It happens. But at least you started off your morning right! This oatmeal sounds AWESOME! I’m adding Horrible Bosses to my netflix queue! You should see Horrible Boss’s. It’s one of those goofy type movies, but it’s so funny, everyone seems out of character, especially Collin Farrell. 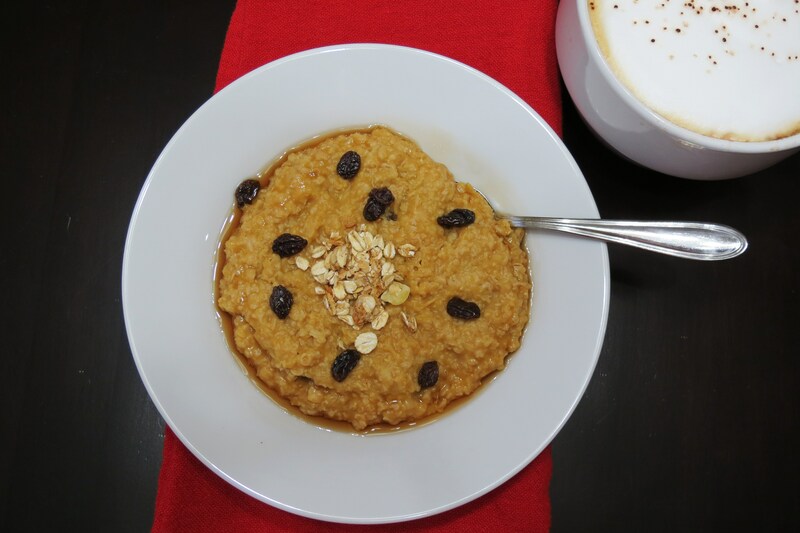 I love having oatmeal for breakfast and I never thought about mixing it with sweet potato, what a great idea! If your a sweet potato fan, you will love it!! My oldest asked for Horrible Bosses for Christmas, so I should probably watch it…he did say it was hilarious. And I’m impressed that you made something so healthy and delicious on your lazy day…I have a feeling I would be melting chocolate and eating dough :/ Happy new year to my new foodie friend!!! 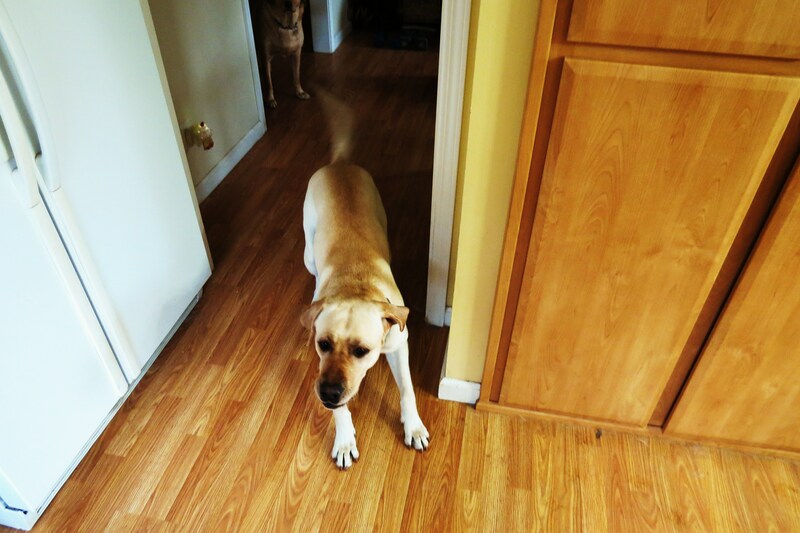 PS…I love your sweet doggie!!! Actually, your day sounds delightful! 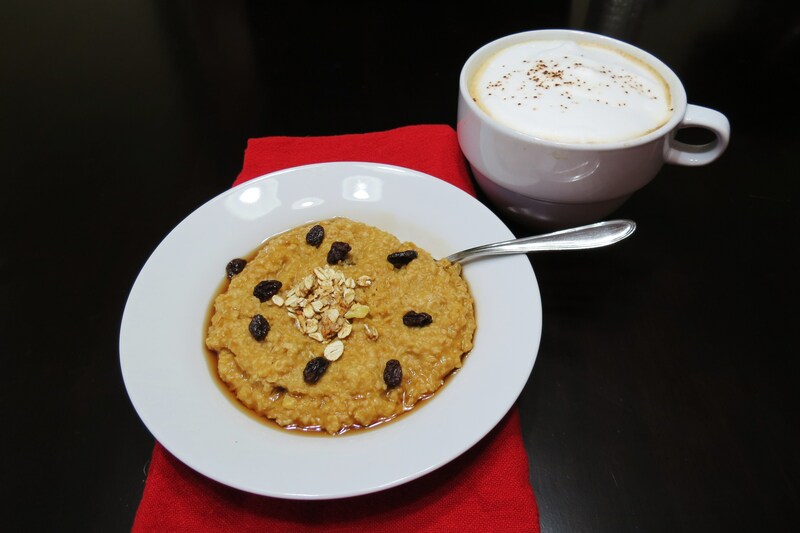 LOVE the oatmeal – I’ve never used sweet potatoes in it before! I can’t wait for the dinner rolls…LOVE making whole wheat bread! Congratulations on your banana lottery win! 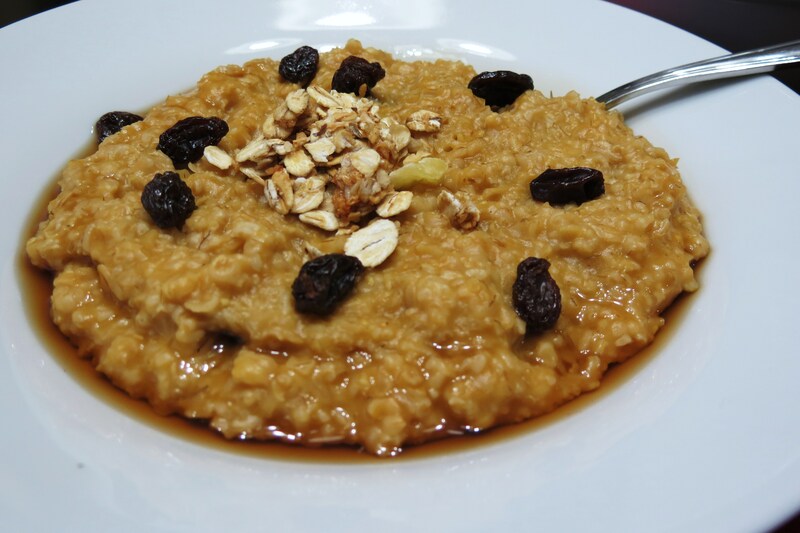 This oatmeal looks creamy and delicious! What a great idea to put sweet potato in it!